with Poplar edges and legs. I saw several similar designs on the internet and I utilized some ideas from all the designs that I have seen. I was able to utilize the t-slot on the bottom of the aluminum extrusion for the fence to mount the hinge outfeed table. I was also able to attach both tables with out having to modify or drill any holes in the original table saw. The outfeed table legs fold up and down using some folding leg brackets purchased from Rockler. The table is very easy open up an fold away for storage and allows the saw to be moved when folded down. The table is very stable and sturdy it has been an awesome addition to have on my table saw. It looks like a nice jig. Congratulations and welcome to Lumberjocks. Can you get a pic of the folding brackets underneath the table? I will try and take picture of it tonight after work. 1. It is there and does a good job when i need it. 2. Otherwise, it is not there collecting stuff, like almost every other horizontal surface in the shop! I’d also like to know more about the router mounting you installed. I keep putting off the router project for my TS’s right-side extension, and i need to just make a choice or two and get on with it. thanks. Nice work. Have to agree if I had another horizontal surface I would just fill it up with more projects or scraps I might need one day. Jonah has a good point. It would be nice to see photos of your hinge mechanism. Well done. My garage shop is like yours – everything on wheels and needs to be stowed when the cars are in the “shop.” So, I’d like to try something similar. Sorry it has taken me awhile to get this. It has still been a little crazy here as we are still dealing with Hurricane Harvey in our area. 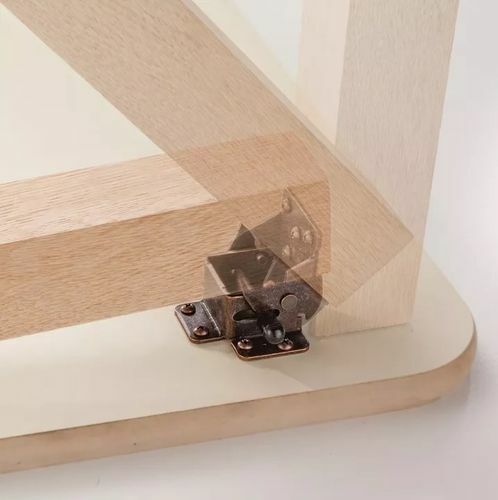 This is not a picture from my folding table, however, it is the same bracket in a product picture from the Rockler website. Search folding leg bracket or item number 39505. Nice project. I didn’t see any high water marks so I am hoping you escaped the flooding. Thanks for that “link” J. Now all I’d have to do is wait for the other knee to threaten to play up so I can use the second hinge!